Casidra’s Board Members and Management Team visited the following projects in the Kannaland region on 27 and 28 June 2017 to give the Board an insight and glimpse of the challenges experienced within projects. The first project to be visited was Amalienstein and the Board was overwhelmed by the dedicated staff who shared the challenges experienced on the farm. Amalienstein is a non-profitable farm with a relatively small of the dairy, high overhead costs as a result of the extensive buildings and infrastructure on the farm as well as the shortage of production and development finance. The Board and Management also had an opportunity to visit Peeties Vegetable garden, which is located not far from Amalienstein. This is a typical community garden project where Casidra implements numerous vegetable gardens, mostly at schools, churches and crèches. This project was approved by the Food Security CPAC and is managed by Petrus Beukes, a former government employee who previously worked at Amalienstein. This food garden has become a source of food for the community of Zoar, from which they receive their supply of fresh vegetables. 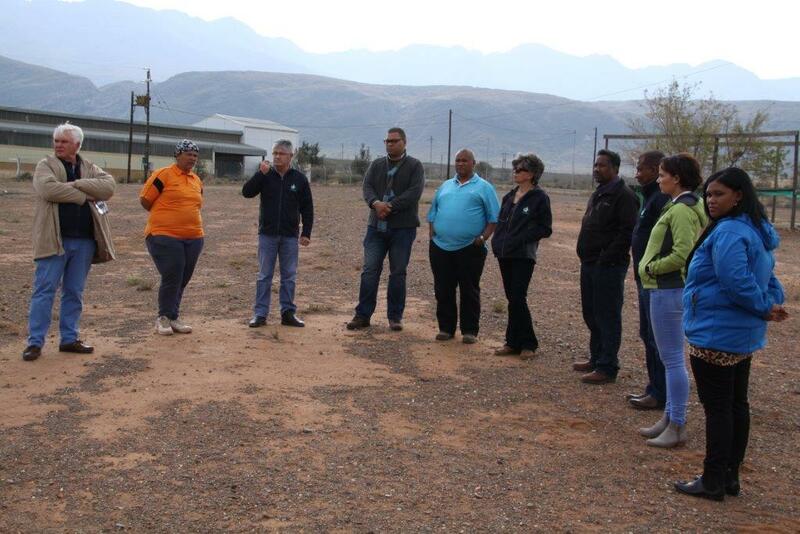 The journey continued to Oudtshoorn where the Board and Management had an opportunity to visit Waaikraal. The farming activities in the farm includes Nguni beef cattle and crop production for vegetable seed, tomatoes and essential oil production (rosemary, geranium and lavendin). The first day’s project visit ended on a very high note at Boetie Hutties, a commercial farm bought by Jolian du Preez, a former Farm Manager of Waaikraal managed by Casidra. Du Preez started the farm’s second production season and Boetie Hutties is an example of assistance given to previously disadvantaged individuals to become viable commercial farmers via the Comprehensive Agricultural Support Programme implemented by Casidra. The project funding was approved by the Seed Commodity Project Allocation Committee. The main enterprises at this farm are vegetable seed and lucerne production. The funding is used for implements and infrastructure and mainly for the production inputs for the first year of production. The second day of the visit resumed in Oudtshoorn with a visit to Kobus se Kwekery. This is a commercial nursery of mainly seedlings for the vegetable seed and tobacco industries. The project was identified by Klein Karoo Seed to start empowerment in the seed industry and is an example of a successful project between a commercial farmer and one of his staff. This project was funded by the WCDoA and implemented by Casidra until in 2014, and since then the project has been successfully managed. The visit ended in Dysselsdorp where Casidra implements rainwater tanks for food production on behalf of the Department of Water and Sanitation and the Breede-Gouritz Catchment Management Agency amongst others. These rainwater tanks have become a dire need in the current drought situation, as every drop counts. The initiative aims to ensure the availability and supply of water as well as equitable and efficient provision of water services at local level. Individual households are empowered to operate a vegetable garden for food security by installing gutters on the house, install a water tank and provide production inputs for the family to start a vegetable garden. Several business co-operatives, e.g A-Z Events and Hiring; and Design and Repair Co-operative were visited. A-Z Events and Hiring is an events management company and rent out catering equipment. It consists of five members; while Design and Repair Co-operative’s core business is manufacturing and clothing company. The Board was impressed to hear that these co-operatives received support in terms of funding and training provided by Casidra to ensure sustainability and profitability of the businesses. At the end of the visit, the Board extended their vote of thanks to the Casidra team for an informative and enjoyable two-day project visit. Casidra’s new Chairperson, Dr Leonie Coetzee, expressed her gratitude by saying “It was well organised and the contributions of our Casidra operational team were most useful. The commitment and efforts of each and everyone is much appreciated”.